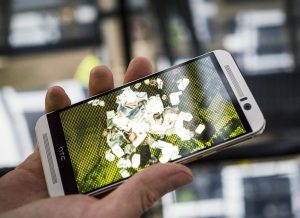 A video vortex visualisation for the launch of HTC’s new M9 smartphone. The mobile app celebrates the M9’s video camera, orientation sensors and advanced WebGL capabilities. The M9’s high-resolution cameras stream into a vortex of 72 3D mirror cubes and the mirrors react, rotate and accelerate based on movement of the phone. 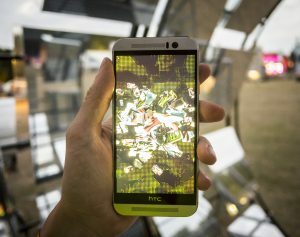 Music festival revellers took the kaleidoscopic app into a giant mirror tunnel and as they rotated the phone, a custom real-time system rotated the tunnel. Inside the mirror tunnel was a Raspberry Pi running programmed control software while custom electronics interfaced with the very powerful motor engineered by Steel Monkey Engineering Ltd. This created a mesmerising, physical, digital and often disorientating giant selfie machine. 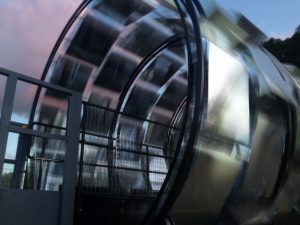 The mobile app was designed to reflect and control BAT Studio’s “Giant Rotating Kaleidoscope Selfie Mirror Vortex Tunnel”. 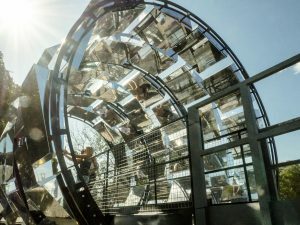 The app and BAT’s mirror tunnel featured at the Lovebox and Wilderness music festivals.